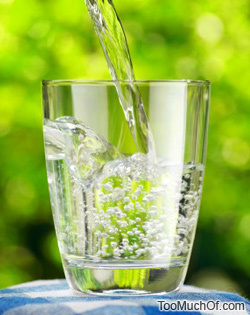 Water (in its pure state) is a compound that exists in a form of liquid that has no odor, taste or color. Almost 70 percent of the planet is covered by water. Water can exist in four states – as liquid, gas, a solid ice substance and in a super-critical state when liquid and gas fuse together under high temperature and pressure. The first decomposition of H2O into hydrogen and oxygen by electrolysis was done by William Nicholson – an English chemist in 1800. Can we drink too much water? Yes, an excessive water intake within a short period of time can lead to water intoxication and inevitably death. Although a rare occurrence, there are plenty of documented cases each year where water intoxication is the primary reason for death. In the initial stage of water intoxication, the serum outside the cells becomes very low in concentration of sodium and other electrolytes in comparison to that inside the cells. This electrolyte imbalance causes the fluid shift via osmosis into the cells, causing progression of electrolyte imbalance and forcing the cells to swell. The resulting low levels of salt in blood serum becomes a condition known as hyponatremia, a.k.a., electrolyte disturbance. The severity of symptoms is expressed following levels of salt in blood, however, with mild cases, the hyponatremia often remains an undiagnosed condition. Neurological expression of hyponatremia symptoms is usually occurred with extremely low level of blood serum sodium levels – below 120 mEq/L. The condition causes brain swelling and can lead to herniation and brain stem compression inevitably causing respiratory arrest. A gradual drop in sodium levels to a very low level can be tolerated, however, if a rapid drop of sodium in blood serum occurs within under an hour, the condition may become extremely severe resulting in heart arrest and death.